On Oct. 14, 2018, Pope Paul VI will be canonized by Pope Francis. St. Paul VI will enter the ranks not only of the thousands of holy women and men who lived heroic lives in conformity with Christ and now stand as our models and intercessors, but also the particular ranks of the late 20th-century popes, including St. John Paul II and St. John XXIII. Almost the entire second half of the century saw Christ’s Church guided by men of extraordinary virtue. So what is Paul VI’s distinctive voice between these other two greats (not discounting the brief reign of John Paul I)? What we find is an unassuming man who quietly established developed many of the priorities we now see in the 21st-century Church and who can guide our lives and work to further the building of the kingdom here on earth. Prior to his election, Giovanni Battista Montini had been an advisor to Pope John XXIII. He was considered a theological moderate in the exciting time of the Second Vatican Council and was definitely considered a “Vatican insider.” These were among the reasons he was considered an appropriate successor to the charismatic convener of the ecumenical council. 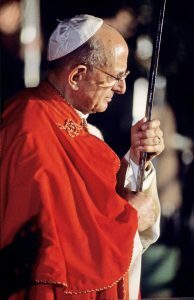 He shepherded Vatican II to its conclusion and then had the onerous task of guiding the Church through this period of momentous change. The events of even the first half of his pontificate would be more than could be explored in this article. Rather than look at a historical survey of the new saint’s work, we can look at four particular areas of his leadership and work in greater detail, with an aim to seeing how his intercession remains especially relevant for us as teachers and catechists today. 1976: Paul VI during the way of the cross, Colosseum, Rome, Italy. Just before the end of the Council, Paul VI established the Synod of Bishops. 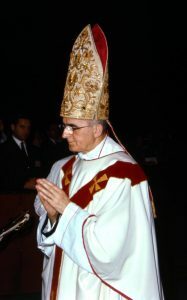 This was the beginning of a new expression of collegiality among the bishops of the Church that allowed the pope to more easily gain insights from those who were “closer to the action of the Church.” Paul VI also began a reform of the Roman Curia to streamline bureaucratic processes and allow the Church to do her work more efficiently around the world. In the contemporary Church, Pope Francis has made particular use of the Synod of Bishops both in meetings on the family and the present meeting on youth in the Church. The reform of the Curia began right after the Council, but it has continued to be an ongoing process. These changes highlight the importance of the Church constantly reflecting on how to best accomplish her mission of being a sacrament for the world. This in no way means a constant process of revision of Church teaching; rather, it is a matter of finding the best ways to learn what God’s people need — and then finding the most effective ways to address those needs and express her teaching. In our work, we should not be content to just teach and minister as we always have without really listening to the needs and circumstances of those with whom we come in contact. Pope Paul VI also introduced the modern view of the pope as a world traveler. The papacy has always had its foundation in Rome, but the mission of the Church has always been to the whole world. Paul VI was called “the Pilgrim Pope,” and he was the first pope to visit six continents during his papacy. This set the standard that was followed by the extensive world travels of St. John Paul II and, to a lesser degree, Pope Benedict XVI. Pope Francis has also maintained this aspect of the papal office, reminding us that our Church truly proclaims the universal message of salvation for all peoples. Paul VI’s world travel also included sincere engagement with the call of Vatican II to foster greater ecumenical dialogue between Christians and interfaith conversations with non-Christians. Paul VI formed the Secretariat for Non-Christians, which later became the Pontifical Council for Interreligious Dialogue. He understood that open, equal dialogue between persons of all faiths not only served the cause of peace in the world, but was also essential in the search for truth. Dialogue in the search for truth is not a watering down of the specific content of Christian faith, but rather an acknowledgment of the richness in how God has made himself known to his children. Sincerity and dialogue in pursuit of the truth inevitably lead to Christ. Many of us will never have the opportunity to be world travelers in service to the Gospel. But an openness to and awareness of people’s different experiences, cultural perspectives, and levels of understanding is required for our work, no matter where we are. Teaching and ministry put us in front of a great variety of people, and we have to meet them in their circumstances so we can be like another St. Paul who wrote, “I have become all things to all …” (1 Corinthians 9:22). september 29 – october 29, 1967: 1st synod after Vatican II Coun., Bas. Saint Peter, Roma, Vatican. What wonderful “marching orders” for our own work as catechists! 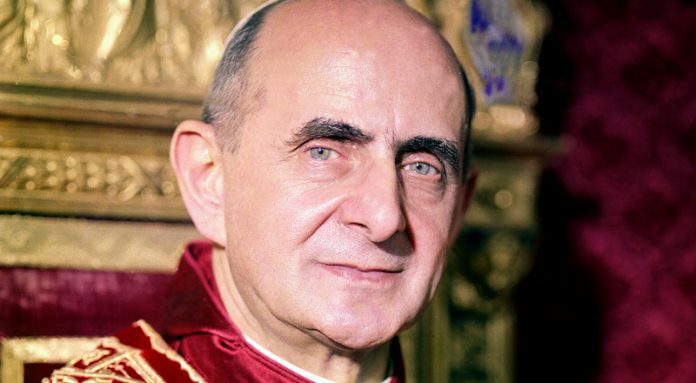 The fourth legacy of Pope Paul VI’s pontificate is the last encyclical he wrote, the document that defined his papacy in the minds of some: Humanae Vitae (Of Human Life). This encyclical, which is actually about the meaning of married love and the place of the marital act in it, is more commonly understood as “the birth control encyclical” (as it condemns the use of artificial contraception). Anyone who wants to appreciate the wisdom of our new saint would do well to read this important document with an open mind and an open heart. Its conclusions are hardly controversial when placed in the context of the whole tradition of the teaching of the Church. Furthermore, if the teaching of Humanae Vitae could be better understood and promulgated, we could witness a revival of a whole and holy marriage culture in our world. The benefits of better marriages, in turn, will have ramifications for the quality of life of all peoples. We can participate in this revival by our teaching, but also by our own witness of life. Pope Paul VI died on Aug. 6, 1978. He was blessed with circumstances that allowed him to enter into the experience of his death over the period of a few weeks. A note he wrote before his death expressed his great joy even as he wondered about the quality of his endeavors as pope. While he was not a martyr, his life and death remind us of the call to heroic witness in our labors, even when we are misunderstood or perhaps vilified for our teaching. We can persevere in joy, knowing that our struggles more readily conform us to Christ. The two miracles that have been attributed to St. Paul VI for his canonization both involve the healing of unborn children. What an extraordinary witness from heaven! Paul interceded on behalf of people outside of our normal discourse (i.e., unborn persons) who had not yet been formally evangelized by hearing the Word and who were living witnesses to the meaning of marital love. Truly these were fitting intercessions by the saint! As we continue our work as catechists, teachers, and witnesses, we can aspire to the example provided by St. Paul VI. Let us call on him fervently as we continue the work of the new evangelization, as we strive for a healthy marriage culture, and as we work to preach the gospel to all people. We can trust in Christ’s words just as the Holy Father did: “I am with you always, until the end of the age” (Matthew 28:20).